Going Nutty! : Fire in the Hole!!! How many of you have a military background? Do you have training for hostage situations? Do you know the rules of engagement? 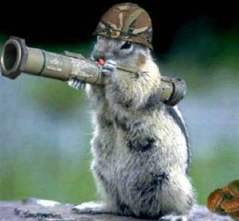 Grab your artillery ladies- we are going in!!!! Where are we taking this army of Squirrel-friends??? We are heading over to Yahoo! and we are getting my email BACK!!!! It tells me to wait. It tells me to close my browser and restart. It tells me to delete my cookies and empty my cache!?!?!?! I'm not eating any cookies and I don't have anything hidden anywhere!??? (Just kidding- I went to Firefox Preferences and took care of both of those. I don't like being told no. I give the orders around here and I want to read my email!! I wanted to post the giggles and laughs we had while eating pop rocks for the first time. But now I am grumpy. 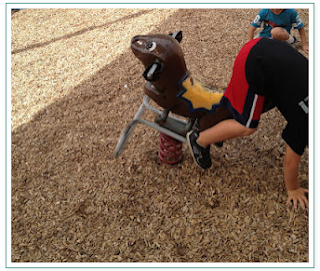 I think the only thing that has made me giggle since I got home was the playground squirrel on Reagan's blog. I am going to hit up our PTO to get these on our playground! There must be something in the air because this squirrel looks grumpy too....so grumpy in fact that he threw off the guy on his back. Squirrels don't like guys on their backs! And we don't like it when Yahoo! holds all our email hostage! I am going to take lots of pictures tomorrow for the linky at Holly's. I am going to upload those pictures (tomorrow). but I CAN'T get into MY email to send them anything!!!!! Throw that "kid" off your back like an angry squirrel at recess! Oh this whole post has me laughing :) It started with the picture lol. Hopefully you get your e-mail back soon!